Gor Mahia will be short handed as they face off with Petro De Luanda of Angola. Jacque Tuyisenge, the leading scorer this season will miss the match through suspension as will Philemon Otieno “Mbish”. Also missing will be Dennis Oliech who has yet to recover from the injury he picked up in training. Ernest Wendo also has an injury and Wellington Ochieng has malaria. In their absence, Nicholas Kipkirui will be relied on a lot more for goals. Should Oktay decide to field a second striker, it will likely be Ugandan Erisa Sekisambu. Petro fans are known to turn out in large numbers as confirmed by Allan Wanga who used to play in the Angolan league. They tend to rely on their pacey wingers for rapid counter attacking raids. “Expect a highly intimidating fan atmosphere, awfully humid weather, and an intense, fast-paced game complete with plenty of wing play. With Mbish and Wellington missing, coach Oktay will need to find other options at full back to contain the speed of the Angolans. Petro will be buoyed by the return of experienced captain Ricardo Job Estevao, known popularly as Job. He missed the opener against NA Hussein Dey. He is vastly experienced. He first played for the Angolan national team in 2007 while aged 20. Petro de Luanda finished second in the Angolan league in 2018 and this term they are placed third. Petro was formed in 1980 and has won the Angolan league a record 15 times. However their last win was as far back as 2009. They haven’t played much continental football of late. Their last appearance in continental football was in 2015, a factor which Allan Wanga thinks will work in Gor Mahia’s favor. The match will be officialted by three Eritreans with Tsegay Mogos Teklu as centre referee, assisted by Berhe Tesfagiorghis and Suleiman Ali Salih. The last time Gor Mahia faced off with an Angolan side was in the CAF Cup of 1993 at the quarter-final stage. The team was Atletico Aviacao of Luanda. Gor Mahia had reached this stage after eliminating Uganda Coffee and Hellenic of South Africa. 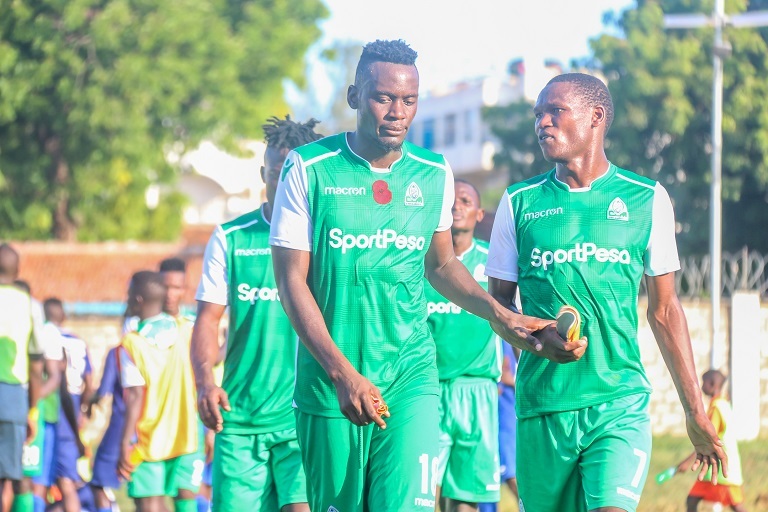 During this period, Gor Mahia boasted what is one the best defensive units the club has ever fielded: Tobias Ocholla, Zedekiah Otieno, Sammy Omollo “Pamzo”, Paul Ochieng, Joseph Owino: All national team players, manned the defence at this time, while Allan Odhiambo was a tall steel wall in the defensive midfield. So the club hardly conceded goals. Unfortunately for Kogalo, the attack was blunt. Gor Mahia experimented with a number of coaches during this period but none could come up with a scoring formula. Many attackers were tried during this period. So when Gor Mahia played Aviacao, their inability to score was their demise. The first leg in Luanda ended 0-0. The second leg at Nyayo stadium also ended 0-0. The Angolans were playing for penalties. They employed all manner of time wasting tactics. At one point a player blasted the ball outside the stadium. During the penalty shootout, goalkeeper Joseph Asembo did not save a single penalty. The towering Asembo was an excellent shot stopper. But penalties was his achilles heel. Thus Gor Mahia went down on penalties. Missing both Tuyisenge and Oliech is not good news at all.However there is depth in the squad and Kipkurui can as well partner ssekisambu upfront. The main focus is on the mid and defense, no conceding away goals by neutralizing their so called speedy wingers. Good luck and may God grant us victory. @JamriAmbo, I concur with you that Jasego should update us and continue giving us more information. All the best to the team.it will be interesting to see how we will line up considering we have quite a number of absentees,but we pray for victory!! It is always so sad for any team to go to battle without the input of all its troops but that is where we are now and that being so , its incumbent upon those who have the fortune to make the cut to emulate what Momanyi and Joaqim did in the absence of Shakava and Joash and in this specific situation , the ball is squarely in the court of Erissa Ssesikambu and whoever the TB will deem fit to fill the gap left by Philmon at right back . If whoever fills in right back rises to the occasion and give like Momanyi and Joaqim did then it would be going forward be a blessing in disguise for the team in the sense that it would release Philmon to go back to his rightful place in the centre of the pack and add competition to the position with the Wendos and Juma . It is not always that a coach will wish to disrupt a winning formation but in this case his hand has been forced and if the luck falls upon you tomorrow , make sure that you make that position permanently yours . @Jasego, I hope we have also intel on their game plan and video of previous matches. Some years back, with Zico as head coach of the Kenya national team, I watched a battle Royale in Luanda between young Boniface Oluoch vs the Angola national team. That was one memorable match for Boniface at his best as a goalkeeper and Zico at his best as coach. We all know that the usual thing that happens in Africa when a team plays away, happened. Boni was robbed through an openly dubious goal in the last seconds of the match and Zico was robbed as a coach. Then, Boni was plying his trade in Brewkenge. My point: Boni and Zico payback time could not come at a better time than this. Your Christmas has come early. Go back there and finish the unfinished business. Go back to Luanda and inflict pain. Pain that will rate at 10 over 10 in the Numerical Pain Intensity Scale. Tunayo kazi moja tu, tunayo kazi moja. Sababu ya kumpiga tunayo,…Uwezo was kumpiga tunao na niya ya kumpiga tunayo. Tunayo kazi moja tu tunayo kazi moja. K’Ogalo boss Hasan Oktay expects a “good and attractive” game against the record Angolan champions. “I have watched them so far three times; very strong, quick and organized team. They lost 2-1 to NA Hussein Day – deflected goals from set pieces but they look very dangerous. Even in the local derby they lost but missed a lot of chances. Anyway it’s going to be an attractive and good game and I’m looking forward,” said Oktay. Well said coach. In saani ok tali. That kind of preparation is what makes a top notch tactician. It is a sure bet that even Petro has reviewed our videos, but no problem. I cannot stop rubbing my hands in glee. @Bloggers, Jakoyo, Ingo and Gor Player have all gone mute due to thrashing of their favorite team Ingwe or Chui or Paka. Meanwhile Mathare continues to cede ground in preservation for the rightful owner of number one who is away on international assignment. We trust in Oktay, Zico and other esteemed commanders of Kogallo green army including jasego for tomorrow’s good outcome. God bless you all. Hata hivyo adui mwombee njaa, akina jakoyo, gor player and ingo wazidi kuumia.Afc is now second from bottom after posta victory. Kazi ni moja, nia ni moja, ari ni moja! Ushindi kwa timu kubwa K’Ogalo! All the best to the boys! In victory and glory, in defeat and agony, K’Ogalo for ever! Watched the Simba va El Ahli game and it was so amazing that a game played on a tuesday in a stadium with a capacity equalling our kasarani was filled to the rafters , compare this with a game with Zemalek played on a weekend where we barely registered one sixth of the stadium’s capacity and yet we have the audacity to brag about how our fanbase runs into millions , all we good at is coming up with millions of reasons why we dont go to the stadium -mara the stadium is far , oh they should reduce the 200bob , oh the market has not been properly marketed , oh this , oh that and a whole load of other unbelievable reasons , This is not good at all and needs to change , we are a huge let down to our boys . Mayoo someone check the kpl league table. Angoma timo chui? They are currently sitting warmly in position 17 aka second last and if league was to be disbanded now they stand relegated. Kweli usiombee mwenzako mabaya. Fake gor player who is an ardent afc fan told us tunaenda nyasi…who’s laughing now? Concentrate on Angola assignment now . don’t loose concentration….don’t loose focus on non issue. Bwana. Locally after kuchapwa SATO Chui is relaxing somewhere in the forests around Mount Kenya for now. They can head up towards Vihiga later with a game at hand or take a walk towards sugar plantation in chemelil, or even go to animal zoo in Kericho. Rangers are watching and ulinzi as well so that they do not reach Kakamega. @Jasego plus the entire TB and the playing unit, kindly remember this in Angola,all champion league and confed matches being played away ,kindly ensure that you pack the midfield, once the midfield is compact then obviously we are going to get good result away, let us control and dictate the midfield, otherwise good wishes. Mine is to wish our boys all the best as they face a stern test in Angola against a quick Petro. If Gor is not working, please engage Mahia just like you did with Zamalek in the second half. I like the suggestion of having Sakava with an ‘H’ in midfield. I think it can work. ….and mine is to say hi to my great friend, The Villager who, with his kind permission, should allow me to refer to him for today only as Creative Village. Blackberry you are a big player in your own right. Remember that through you, Gor Mahia now holds Africa’s record of scoring the earliest goal in CAF-organised competitions (a fete you achieved against Yanga in Dar last year). Rise up today and show leadership in that strike force. Unleash the Colossus that you are. Unleash those darting Rahim Sterling runs of yours and put Petro Atletico to the sword. Bwana Bb…I just don’t understand. Look at the lineup. Kipkurui Wuod odongo goyo bunde konindo ataro has been benched…BlackBerry benched. What tactics are these Jasego? Osiepa it has held my mouth. I don’t know Oktal’s game plan, honestly. Blackberry, Kipkirui and Sammy Onyango are far better in a match that has no room for so many slips and falls. I think the plan is to increase the speed in second half by bringing in the likes of Kipkirui and Onyango. Black berry can replace Kahata or Bonface. But I’m sure the TB has a good plan. otek small but lets just wish the lads best of luck, we can winn,,,, go go go mahia….. I really envy the men and women who dont give a damn about football for they are spared these weekly pressures and stresses we go through , take for example a person who supports Afc Leopards and Chelsea , You are clobbered on a saturday and even before you recover and believing you are going to recover , you find yourself walking to the back of the net six times to retrieve the ball , but be that as it may I dont feel any of that stress today and that is because we are neither Afc nor Chelsea . To the one who asked about where the line up is , please go to Goal.com and thereafter go to your sofaset branch and watch the game live from supersport 9 , Time 7 .00pm. @teddy sofaset got the line up on my twitter account. But live coverage should be GoTV SS4 at 6:00pm since NBI and Luanda(Angola) is 2 hours difference amd the kick off is 4:00 pm. Someone shade more lights please. Short handed the writer of this article should change because Gor still has players who can rise to the occasion. We have Kipkirui, Bonface,Onyango,Kahaya,Muguna,Berry just to mention but a few. Otherwise all the best to team kibwa the boys will manage that am sure. For those who’ve been in this for years there is a time when Gor had nine of the first eleven suspended but still managed to beat teams at the East and Central club championship held in Khartoum in the former larger Sudan including our shemeji in the finals so no course for alarm remember when Moment I and Joakim were handed their maiden when in Cameroon what happened? How can somebody field Mustafa. Who advised on that. Mustafa should never be fielded in any continental match. @JTGJ, you forgot to mention that Batambuze carelessly gave the ball away for the first goal and Joash is being skinned endlessly on the right one of the occasions leading to the second goal.